Astrophotographer Giuseppe Petricca took the image from Sulmona, Abruzzo, Italy. The dots forming a curved figure-8 in the sky mark where the sun appeared every day at the same time in a pattern called an analemma. This strange figure of the sun creating a figure-eight shape in the sky is an awesome sight, but required a year of patience by a dedicated photographer to create. Veteran astrophotographer Giuseppe Petricca took the image from Sulmona, Abruzzo, Italy using a Nikon Coolpix P90 Bridge. The dots forming a curved figure-eight pattern in the sky mark where the sun appeared every day at the same time. 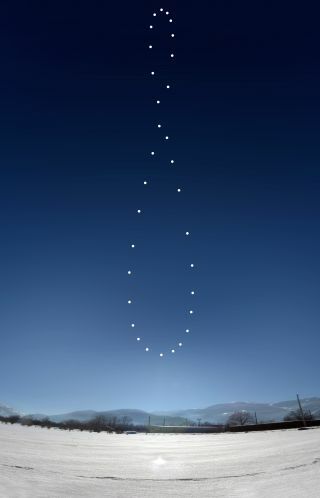 A composite causes the pattern called a solar analemma. Important: Never look directly at the sun through a telescope, binoculars or with the unaided eye without proper protection. Serious eye damage or blindness can occur. Astronomers and veteran skywatchers use special filters to safely observe and photograph the sun. The tilt of the Earth's axis and its variation in speed when rotating around the sun causes the graceful figure-eight pattern. If the Earth had a circular orbit and its axis was at 0-degrees tilt the analemma would not exist, since the sun will be always in the same place in the sky at a determined hour of the day. If the orbit was circular, but the axis was tilted like our real one, the two lobes of the figure would be equal in dimensions. Instead, if the orbit was elliptical and the axis was not tilted, the analemma would be only a line that would go from east to west. Follow us on Twitter @Spacedotcom. We're also on Facebook and Google+. Original story on Space.com.